One of my favourite creations in the Harry Potter world is Qudditch. Imagine creating a brand new sport, and one with so many rules and players? Amazing! 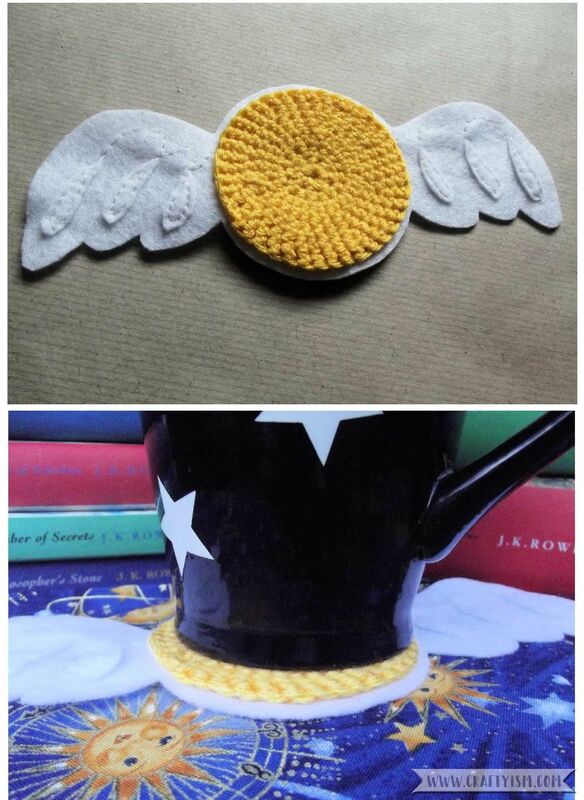 Of course my favourite bit is the golden snitch. It’s meant to be very tiny, but for this DIY I have enlarged it and flattened it out so that we can rest our mugs of Butter Beer on top. This tutorial includes a free printable PDF template for you to download. Just click on the link in the ‘You Will Need’ section to download it. Chain 4 and join into a circle. 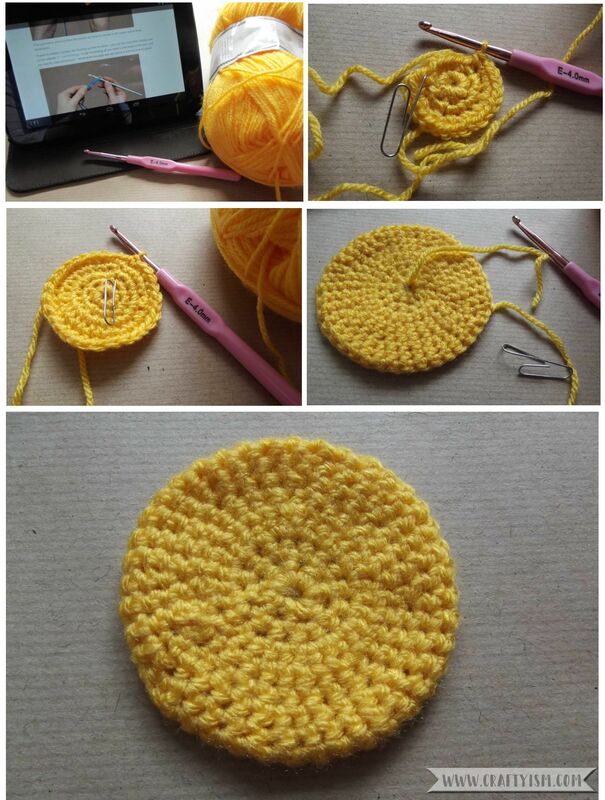 8 double crochet into the middle of the circle. Chain 1 then 1 double crochet in each stitch, 2 double crochet in every 4th stitch. Slip stitch into first stitch of the round and tie off. Using the template download, cut the main section and small wing decorations from glittery white felt. 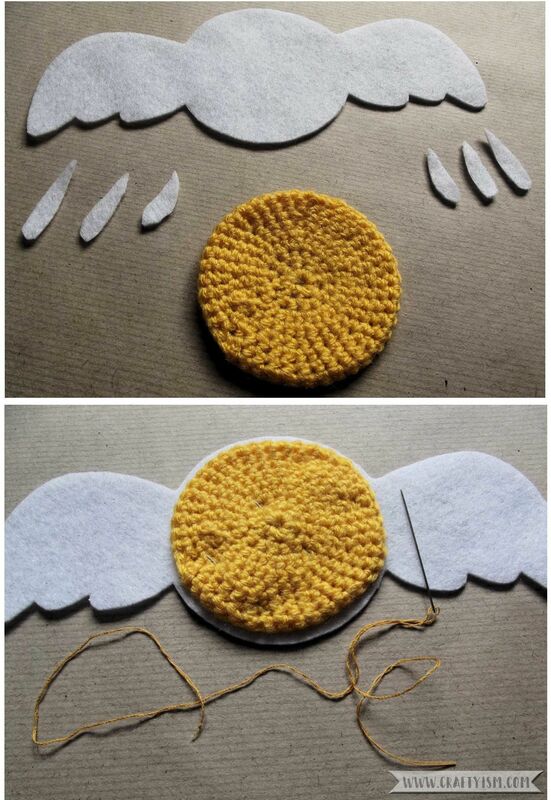 Place the crochet circle in the centre of the felt and use the needle and yellow thread to stitch all the way around the crochet circle, attaching it to the felt. Follow the guidelines on the template and use the white thread to stitch on the wing decorations. Lastly stitch the extra pattern decoration lines on the wings. As well as being able to rest your mug of butter beer in the centre circle, there’s also room to perch a chocolate frog on each wing! This is my first time writing a crochet pattern, so if this one doesn’t work for you, have a search for ‘crochet a flat circle’ and you’ll find so many experts who are better placed to help you than me! Also, another first is the downloadable template, so if you have any problems with this, please get in touch and try to I’ll sort it out. I hope you enjoy your new coasters, they’re sure to be a talking point with your muggle house guests.